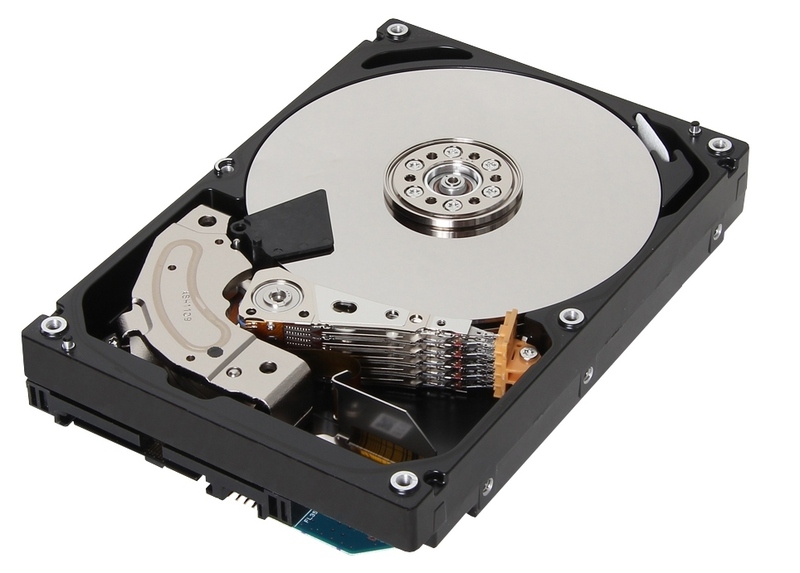 Despite the focus on immediate storage is on the solid-state drive, whenever a large backup is needed then the mechanical hard-disk drive is still reigning supreme, and the demand for data density has never been higher. In the consumer space 4TB drives have been on sale for a while, currently for around $164 in the US or £123 in the UK. These were four platters at 1TB each, or five platters at 800 GB each, using PMR (perpendicular magnetic recording, remember this video?). Toshiba Electronics Europe has just announced the amalgamation of the higher platter density with the higher number of platters, in an enterprise level 5TB 3.5” 7200 RPM drive. These new drives will fall under the MG04 heading, succeeding the MG03 range. 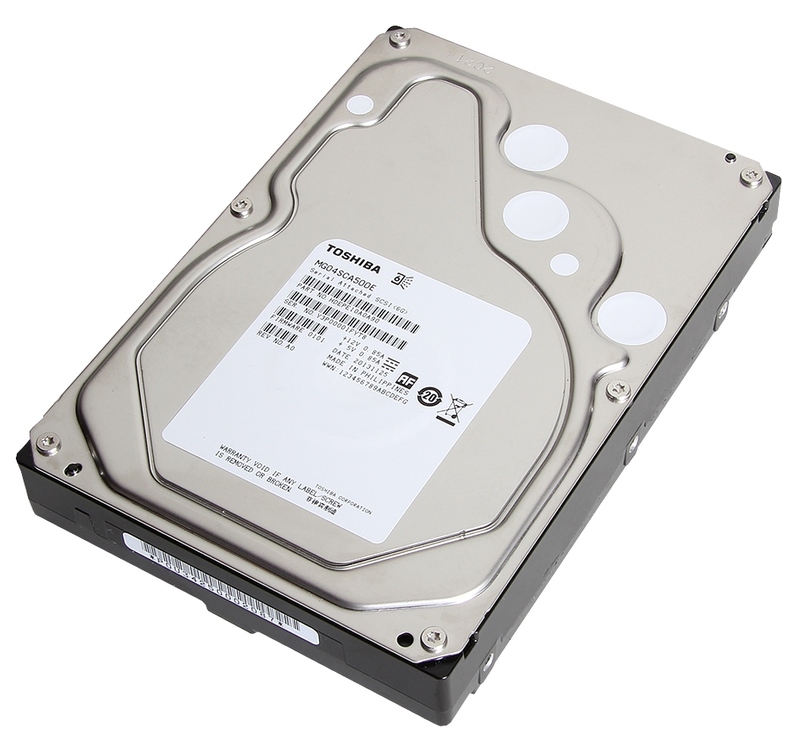 Some of these drives also feature Persistent Write Cache Technology, which Toshiba states improves application performance and data-loss protection. The drives will be equipped with either 6Gb/s SAS (MG04SCA) or 6Gb/s SATA (MG04ACA) interfaces, and can also be supplied with Toshiba’s Sanitize Instant Erase (SIE) functionality. The SIE drives have models that support either 512e or 4Kn format storage modes for modern performance or legacy applications. The drives are quoted with a 4.17ms average latency time, 8.5-9.5ms read/write seek time and a sustained transfer speed of 205 MiB/s. MTTF is at 1.2m hours, with idle power quoted as 6.2W, with 11.3W during read/write operations. The internal buffer for SATA drives is set at 128 MiB, with SAS drives having 64 MiB. 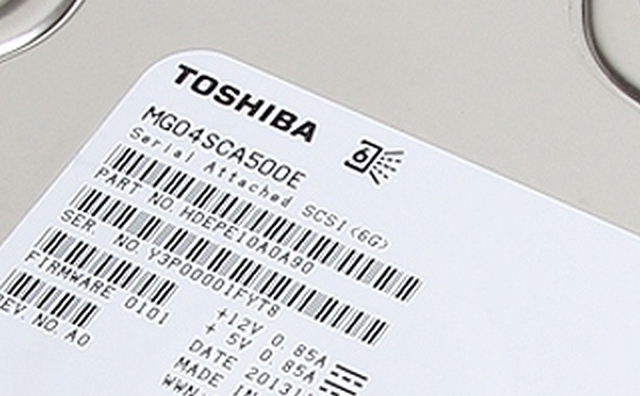 No information was given about release date and pricing – given the enterprise focus that Toshiba Electronics Europe is giving this product, I would imagine the focus would turn to local Toshiba representatives for individual pricing. Given that one other company has been quoted as using Shingled Magnetic Recording in their 5TB drives for 2014, after speaking with Kristian we are under the assumption that this is still PMR technology. I must confess that at this point in the HDD cycle we might have 6TB 3.5” drives in the consumer market, but the recent focus on SSD consistency and a combination of overcoming physical limitations via new methods might be causes for the delay. 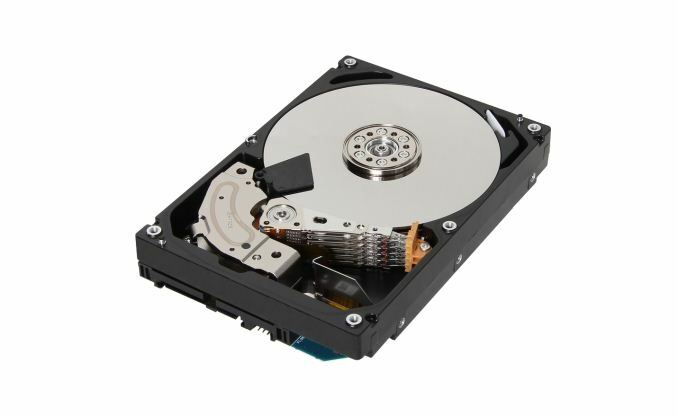 HGST are sampling their 6TB helium filled drives, however that technology is aimed solely at the enterprise market. Should we get a sample in, keep your eyes peeled for a review. I believe PMR is a TLA for "Perpendicular Magnetic Recording" not "ParaMagnetic Recording". Toshiba said they will be sampling in february. And ofc Segate said they'll ship 6TB, 6 platter enterprise drives early in the second quarter. But i wouldn't expect anyone to be in a hurry to ship in consumer,they need to control the pricing decline to maximize profits and with only 3 players it's not very likely for anyone to try to gain share.Going forward,new tech requires investments so that's another aspect that will slow them down,not because they can't do it but because they have no reason to .The limitations are less about the tech and more about financial aspects.The lack of competition is unlikely to change, might even get worse since WD has been forced by China regulators to run Hitachi as a separate company but very soon they'll try to get rid of that.So expect price/GB to decline very slowly and capacity to go up only to allow them to stay in line with demand at an ideal cost. Prices have fallen and fallen substantially. To claim otherwise is ridiculous. The poster is clearly referring to the past 2.5 years. In that time, hard drive prices have not fallen. That you suggest otherwise is ridiculous. In mid 2011, ostensibly due to the Thai floods, prices greatly increased. As others have noted, the flood excuse didn't begin to hold up. The industry shipped more drives in 2011 than they had in 2010. By Q1 of 2012, all of the impacted factories were either reopened or relocated, yet prices remained high. Since mid 2011, prices have fallen somewhat, but have still not reached the 2011 rates. A full retail priced 2TB drive in 2011 was cheaper than today's retail pricing. Such pricing trends are nearly unheard of in the technology industry. That this anomaly has lasted over 2.5 years clearly suggests tacit price fixing, perhaps even active collusion among the few remaining hard drive manufacturers. Tacit price fixing is often not actionable, but collusion is. For most of the past year, have been rumors of government price fixing investigations into the hard driver industry. Hard drive prices still show no signs reverting to natural price trends. Lack of price drops over such long periods of time only happen there is overwhelming demand, supply shortages, or price fixing. Since first two can easily be ruled out, the last possibility, price fixing, is the most likely. It wasn't price fixing and it wasn't collusion. The HDD industry was simply too competitive. Margins prior to the flooding were razor thin, unhealthily so (I heard about 5%, with some HDD companies going below 3% - this is the reason IBM bailed out of the industry). They had the slimmest margins in the computer industry (aside from memory when there's a glut). The lack of significant price drop in the last 2.5 years is simply the margins increasing to healthy levels. Manufacturing costs dropped, but retail prices did not, thus increasing the margins.